Leica RTC360 Laser Scanner Released: The BLK360 on Steroids! With the BLK360, Leica redefined the 3D Scanning Space in terms of features and Cost. 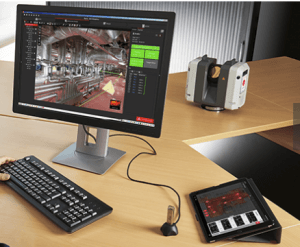 With the new RTC360 (or BLK360 on Steroids), Leica brings us a Tier 1 Reality Capture solution that allows users to document and capture their environments in 3D, improving efficiency and productivity in the field and in the office through fast, simple-to-use, accurate, and portable hardware and software. The RTC360 3D laser scanner is the solution for professionals to manage project complexities with accurate and reliable 3D representations. Capture scans, including enriching High-Dynamic Range (HDR) imagery, in less than two minutes. Automatically record your moves from station to station to pre-register your scans in the field without manual intervention. Augment your data capture with information tags illustrating the opportunities for better planning, reflect site reality, and boost your teams’ situational awareness. Again, the RTC360 has Real-Time Point-Cloud Registration In The Field. Leica has named the technology VIS for Visual Inertial System. VIS performs automatic point cloud alignment in the field without user interaction. 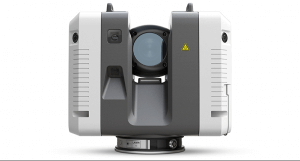 Because Leica designed the RTC360 for people who use 3D data but are not actively scanning (yet), they designed the system with an eye on workflow simplification. Basically, VIS uses the 3D coordinates of features—like the edges of a door, tanks, pipe supports – to track your position as you move within your scanning area. This has been used by other vendors but has always added drift (compounding positioning errors as you move positions in your site – imagine a piece of paper rolling up at the edges). The VIS System solves the drift issue by pulling in data from all the other on-board sensors to stabilize it and remove the drift – Fast, agile and precise 3D reality capture! Fast: The new Leica RTC360 laser scanner makes 3D reality capture faster than ever before. With a measuring rate of up to 2 million points per second and advanced HDR imaging system, the creation of colored 3D point clouds can be completed in under two minutes. Plus, automated targetless field registration and the seamless, automated transfer of data from site to office reduce time spent in the field and further maximizes productivity. Precise: Low noise data allows for better images, resulting in crisp, high-quality scans that are rich in detail and ready for use in a range of applications. Combined with Cyclone FIELD 360 software for automated registration in the field, the Leica RTC360 scanner offers outstanding precision that can be checked on-site. Pre-Registration in the Field: On-site the user can automatically capture, register and examine scan and image data. The user interface combines easy handling of complex calculations with a graphical user guidance that offers a remarkable user experience, also for novice users. For small areas, fill-in and with the ability to larger spaces in a pinch, the BLK360 has no equals. The RTC360 is the BLK360 on steroids: 3D Capture in large areas: quicker, faster and with higher precision. The RTC360 brings to market a new level of 3D scanning. Finally, Leica closes out the high end with the P-Series: Dual Axis Compensation, Target Acquisition, Working on Grid, Survey Grade, and -20 to +50 Operating Temp Range. Almost every company is producing layout drawings in AutoCAD Paper-Space, and most will agree that the existing production methods are generally slow and time consuming. ECE set out to improve layout drawing production and we’ve done it with VIEWWorx! VIEWWorx is the newest ECE Worx Plug-in and it makes creating Named Views so easy every designer will want to start using them. Named Views have been in AutoCAD forever but no one uses them because they are so difficult to create and manage. Well that is not the case anymore. Creating AutoCAD Named Views is just the tip of this iceberg! VIEWWorx automates Paper-Space drawing production too. Do you want a separate drawing for every unique line? Do you want a separate drawing for every piping, equipment, electrical, plan? Do you want to automatically create steel detail layouts? If the answer is yes to any of this you have to see VIEWWorx in action. What about those odd angle views? How many times have you needed a view at some angle between X and Y? That is not an issue now because VIEWWorx creates Named Views at any angle. Now designers can easily define plan, elevation, and section views within models, or XFEFs, then simply ‘Hit The Go Button’ to produce one, two or hundreds of layout drawing automatically. VIEWWorx: Named Views Made Easy and Much More! This stand-alone software application outputs the contents of CADWorx Plant Specification files. It extracts a complete listing of components with exacting detail that have been added to CADWorx Specification Catalog (*.cat) and Project (*.prj) files. Companies looking to improve the quality of their piping specifications will find value in SPECWorx because it lists exactly what will end up in the 3D models, Bill of Materials, Orthographic and Isometric Drawings. Fixed a naming convention where the spec names too long may cause an error. Added ability to check Index Code Description Field in the different field formats.